It comes as no surprise that Arian Ghorbanpour — an Institute for Sustainability, Energy, and Environment (iSEE) Postdoctoral Researcher for CABBI in the David Flaherty Research Group — has always been passionate about science. His passion for discovery has not only manifested in his academic pursuits, but in his personal life as well. Recently, he traveled intercontinentally and called four different locations home in a very short span. This naturally demands a great deal of flexibility and provides endless avenues for adventure. Originally from Iran, Ghorbanpour arrived in Texas in 2010 to pursue a Ph.D in Chemical Engineering from the University of Houston. He remained in Texas for several months before accepting a postdoc position at the University of Virginia. After his research on the East Coast, Ghorbanpour relocated to Illinois to join the Flaherty Research Group in February 2018. 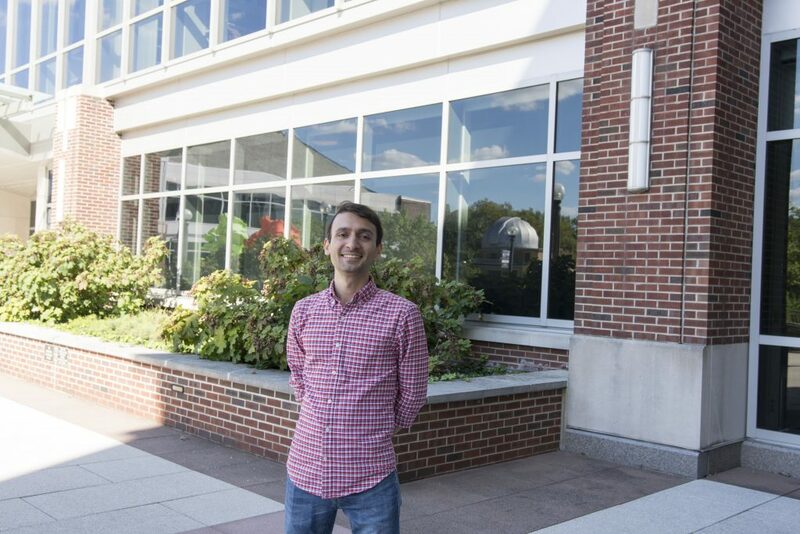 Still relatively new to CABBI and the University of Illinois, Ghorbanpour expresses excitement for the opportunity to explore research with which he never anticipated being involved. Particularly, the intersection between chemical engineering and sustainability. Currently, Ghorbanpour works in CABBI’s Conversion theme, which aims to increase biomass’ feasibility as a raw material for the production of valuable chemicals and organic compounds. Given Ghorbanpour’s description of chemical engineering as the art of “processing raw materials to create new products,” this endeavor falls right into his wheelhouse. “If we have products A, B, and C, and the desired product is B, what changes to the catalyst will increase the concentration of Product B with respect to the things that we don’t want?” Ghorbanpour says. What exactly are the components of these reactions, and what type of product is he aiming to produce? As a whole, one of CABBI’s missions is to use biomass to produce alcohols like ethanol (often referred to as bioethanol). The Conversion theme utilizes chemical catalysts manufactured in-house to convert small chemicals like bioethanol into other, higher-value chemicals — like fuels, alcohols, and lubricants — that can be broadly distributed to consumers. His second objective is to test the catalysts’ performance in the context of real reactions. Using a reactor, he assesses the catalysts’ behavior under a variety of conditions (varying degrees of pressure, temperature, etc.) to quantify how they impact the rate and selectivity of reactions. 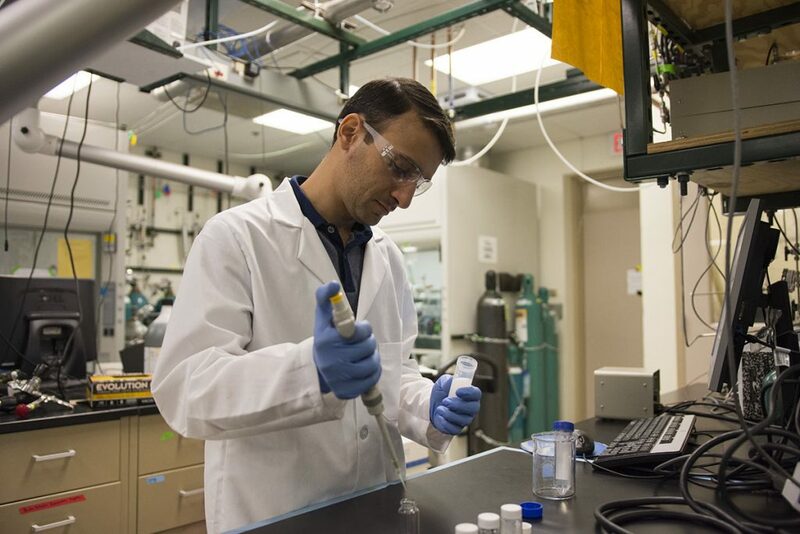 Ultimately, these tests determine which catalysts are the most effective at producing large volumes of high-value products. The goal of using biomass as a source material for chemical production is one that Ghorbanpour heartily stands behind: He considers it a “necessity” that chemical processes are modified to be eco-friendly. However, one of the project’s more formidable obstacles is the issue of economic viability. He emphasizes the importance of holistic sustainability, stressing that while biologically derived chemicals must be cutting-edge in terms of function, they must be financially competitive as well. 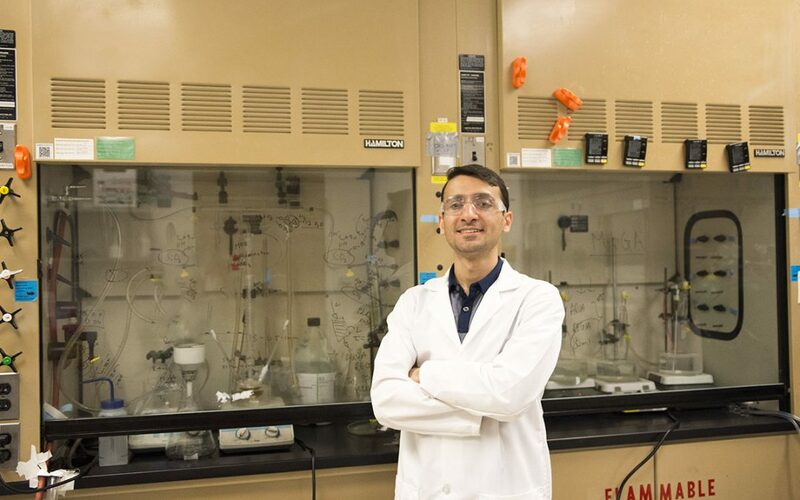 Ghorbanpour’s passion for green chemistry doesn’t end at work: His hobbies are largely centered around appreciating nature. When not in the lab, Ghorbanpour enjoys hiking, exploring the outdoors, and spending time with family and friends (who are spread across several states and countries! ).